I have owned a SO29.2 for 4 years. The steering (wheel) has always been fairly light/touchy, and has more weather helm in stronger winds. i.e In light airs the boats will wander easily particularly with wind astern. This seems to be more noticeable lately. The least movement results in a quick change of direction and requires correction to and fro. Rarely does she keep course going to windward, if the wheel is left free. In an ideal breeze, say 8kts, and good sail set, she can feel well balanced going to windward but does not stay on course very long. Even with the wheel brake on she will go off course in a short distance. I have checked the quadrant and there does not seem to be any adjustment that would improve this. The rudder shaft bearing has minimal play which should not cause such unsteady feel. I believe the mast rake and rig tension to be correct, but I'm open to suggestions here. P.s The 29.2 has a 1.4m draft. Does any one have any ideas on this? Particularly SO29.2 owners. Is this a characteristic of the boat? Sometimes, I wish I has less weather helm. Sounds like you don't have enough, at least in light air. You can increase weather helm in several ways. One is to move weight forward, either crew or equipment. Another is to adjust the balance of the sails, making the jib smaller relative to the main. Both of these are very easy to do and don't cost anything, so you should definitely try them. More difficult would be to increase the mast rake, but that would also affect the helm in heavier air. I'm not an expert on this subject. We have a number of racers on the forum who can give you a lot more detail about what to try. I'll leave it to them to give you better advice. I'm not sure whether you're asking for advice about going to weather in medium to heavy air, going to leeward (the "wind astern" comment), or a problem with the balance of your rudder. Let's talk about weather helm and if you want to follow up on the rest feel free to post a question. Note that I don't know your boat so this is a generic answer. A bit of weather helm is there by design. And it's natural for the boat to round up more in stronger winds. This is good. You really don't want your boat to power up in gusts, you want it to bleed some power. If you really believe that your boat has excessive weather helm then try easing the backstay or if that's intimidating then get a rigger to look at your mast prebend. Backstay tension moves your center of effort forward and back. Beating in light air (you mentioned 8 kts) If your dream is to lock the wheel and sit back then you need to play the balance of the sails. If she wants to head up, drop the traveler a bit, if she wants to fall off, traveler up or sheet on harder. Try to find a place where she's happy. Know that most boats will wander around if you do this, particularly if there's a sea running. The waves will push the bow down and the boat has to react. That will feel like an oscillation in point. Gusts will have the same effect. Sometimes you'll find a groove and the boat will run on rails even if you don't lock the wheel off. But the ocean is a dynamic place and the boat has to react. Bottom line is if you want to point well you need to drive or get an autopilot. As the wind increases the boat is going to want to round up in gusts. Your first move is to crank on all of the corners of both sails. So jib halyard on hard, main halyard, cunningham, outhaul all on hard. If you have an adjustable backstay, crank on that too to flatten the middle of the main. As the wind builds that won't be enough and you'll find you're fighting the wheel to get the bow down. This is uncomfortable because the boat will heel excessively and the wheel will feel quite heavy, but more importantly it's very slow and you're making lots of leeway. You're dragging the flat side of your rudder through the water, that's bad! The solution is to reef. Learn the wind speed range for your boat. If you're burying a rail then you're past the point of reefing. When beating, my boat wants a reef at about 12-14 kts and a second reef at 18. Adjust your jib size to match the performance of the main. You'll find that when you reef the boat will flatten out, the weather helm will reduce, your passengers will be more comfortable and your VMG won't change, or even go up. Yay! As the wind builds into the mid 20s and above, you're going to find that you can't point very well. Sea state will build and you'll slow down with each wave you punch over. The only solution is to ease the bow down a bit. Find the TWA that gives you the best VMG, it's probably between 50 and 65 degrees. Try and steer around the faces of steep waves. At this point the most important person aboard is the main sail trimmer. Learn to dump the traveler in the gusts, bring it up in the holes. The wheel should feel pretty neutral and if it doesn't, tell the trimmer what you're feeling, let them control the helm balance. The traveler should be in constant motion for best performance. If the wind builds into the 30s then my advice is to find a place to anchor and wait it out, gentlemen don't sail to weather! I certainly appreciate your time and effort in your detailed advice David, and will take heed. I look forward to trying all these. Having changed the headsail from a large genoa to the original slightly smaller one with a raked foot had improved the motions, and I have over time experimented with some of these recommendations with some improvements. However, she seems to be more sensitive and somewhat different to previous boats I have owned. But I will persevere as she does give us a lot of pleasure. I welcome anymore advice though. I would suggest making sure the rig is properly setup for the conditions. Straight up and down, for to aft, side to side, the shrouds and stays are not majorly off in settings one side vs the other. If you still have a lot of weather helm, even in light winds, you may need to tip the mast forward some. I shortened the forestay 2", removed a LOT of weather helm! I will have another look at this and consider moving the mast forward and see what happens. Hi Ray, the helm on my SO30i is also very light and does not give much feedback. I think this is largely due to the rudder shaft being set back for the leading edge of the rudder, giving some level of balance to the side forces on the rudder. It is quite a different feel from the unbalanced transom hung rudder that was on both your previous boat and mine. I have a decorative knot on the wheel at top centre for a straight course motoring in the calm, rudder centred. Weather helm is indicated by the position of the wheel for a straight course when sailing, not by any feel that I can detect. I also found it very difficult to steer early on, and it required the wheel to be almost continuously moved through nearly 180 degrees to keep a straight course. None of the normal remedies used by racing people had any noticeable effect. Yet I know they do work with good racing sails, always try them all first. After careful study of our sail shape, I noticed that the maximum draft of the sails was deeper, and further aft than most articles seemed to suggest was desirable. Further, the maximum draft seemed to move aft in the gusts, and each gust rounded us up enough to require another huge correction. I took the sail along to a sailmaker, two in fact, and they stretched the sails out in the loft and told me how the boat would behave with such a sail. Described it to a tee. Clearly the sails, while still relatively new, and looking in good condition, were stretched out of shape, and the cloth was stretching further with the changing load of gusts. It is hard to believe they started this way, with modern computer sail design, but I guess the cloth was poor quality and did not retain its strength for very long. I bought new sails from the local sailmaker. You know him from the yacht club, and they are terrific. As you know, some days, the wind is just turbulent and gusty, and even then, "normal" wheel adjustments keep us on course. On a more stable day, particularly a close reach, I can set the sails with just slight wheel rotation corresponding to weather helm, and hands off, sail for a mile on either tack, and not using the wheel brake. Sometimes I can even adjust course a little by mainsheet adjustments. I think our sail plan is a little small for our preferred light winds, but I can't see how to get the clew of a larger Genoa outside those outboard shrouds, and as you know, you seem to easily sail past us. I like to think our live aboard cruising weight is not helping us, while I assume you keep your boat pretty light. The specs also seem to show the 30i as heavier than your model, perhaps a penalty for the larger rear cabin. Or perhaps I just need some lessons. Seems ironic that we have to converse via the forum, we really should make more effort to catch up over a coffee next time we are there. Please ring when you have some time and see us around. I owned a 2004/5 SO29.2, purchasing it when it was four years old. The original factory sails were pretty poor quality. Replacing the genoa made a huge difference to performance and I sold the boat before replacing the main. The factory sails on my current boat were much better quality and are still in good shape. I should also have mentioned in my reply that there is an intermediate possibility which costs much less than new sails if it works. If if the cloth is stretched, but still stable, it can be worth recutting the luff to improve the sail shape and move the maximum depth forward. Recutting the luff is not too big a job, and I actually tried this first in hope, but it was not enough. A more major recut is also possible, but much more expensive and probably not worthwhile, as at the end of it all you still have old cloth. I found it difficult to actually see the shape moving, but the clue is whether you are having to make bigger corrections to resist rounding up in even light gusts. This is due to the direction of the force on the sail changing as the cloth stretches, and changing that balance you have tried so hard to achieve. Now, with the "new" sails, (they are a few years old now), I can easily get all the tell tales streaming. With the old sails, any pair, but rarely even two pairs, let alone them all. Thanks for all the info. My sails are not the original Jeanneau supplied, although I still have them. My boat came with used locally supplied sails for the same reasons as you and Sitara mentioned. In fact the previous owner also made same remarks. They set quite well and seem to be in good enough shape for our use. I can't justify the expense of new sails. All tell-tales fly correctly except for the very top of the main's which I have difficulty getting right. As you say your boat also has very light steering. This surprises me as she is very different to mine, as I believe you have twin rudders, a skeg, and a deeper (retracting) keel. I remember your demonstration how she turns almost in her own length. So does mine. This is where the characteristic is. She is too responsive in that respect whether under motor or sail. I could do with less weatherhelm particularly in a stiff breeze, which I can ease by flattening the jib and easing the main, but at the expense of not pointing as well. I don't have a traveller. (CenterPoint only). Incidentally, we race against a Beneteau 311, and she is the same. 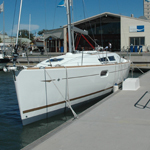 Another Beneteau 36 some time back, also behaved similarly. I think it is to do more with the rounded shape of the hull, the shallow draft, and as you say the rudder design. All in all I can live with it and sail her accordingly. For some time I've thought of experimenting with mast rake, just to see if it improves. ps. In answer to your question of sheeting a larger genoa, on mine the sheets run between the 2 stays on both the No1 and No 1.5, and it is only a matter of positioning the cars. Both work very well and have no interference. Your boat may be different. I think the SO29.2 was originally designed to be tiller steered, as a result the rudder is quite well balanced and this may account for your light steering. In light winds, my boat is also light to steer (and has a tiller). In heavier winds, a bit of weather helm is also normal. I tend to find that I am reefing my main before I reef my 110% Genoa (although my main is a fully battened laminate sail with quite a bit of roach - so it's not short on power). The SO29.2 is a light boat and therefore won't just sail herself. Even with a balanced sail plan, my tillerpilot is still doing quite a bit of work to keep the boat on course. I also can't leave my steering position for more than about 5 secs at a time before the boat starts to wander off course - although this could just be my poor sailing ability!